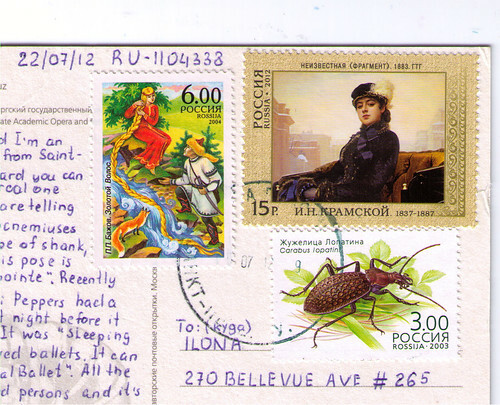 This lovely postcard came to me from Russia this week, as RU-1104338 via Postcrossing. The sender, Cathi, writes that this ballerina is the real deal and not just a posed photo. "Her legs are telling that she's a dancer: gastrocnemiuses look strong, perfect shape of shank, back is not slouching." If you're like me and wondering what that muscle she references might be, it's the calf muscles! She goes on to write a lot more about ballet and some ballet she loves, and why. It was a delightful education. AND, she used fantastic stamps! What a lovely combination of folk art, portrait art, and a fine-looking beetle. I like the folk art stamp the best - is it depicting a fairy tale? Why is this long-haired lady letting her hair down a stream? It reminds me of a watery Rapunzel. If any blog readers, Russian or otherwise, might know the answer, please do elucidate. This is why I love Postcrossing - surprises like this in my mailbox all the time! If you enjoy sending mail and would like to receive more, I highly recommend Postcrossing for adventures in mailing. You will most likely get quite a lot of crappy postcards, but there are gems, too, and the international stamps are always fun. Also I love Russian stamps a lot. Hi, Just found your blog via Danielle and think your Etsy shop is fantastic. Couldn't resist buying some cards! I also love postcrossing blogs so I shall be back. John, thanks for letting me know how you found my blog - I've linked both your and Danielle's blogs now from my Postcard section. Fabulous! Also, thanks for the order! ..."When she lets her beautiful hair down, the water turns into pure gold." "I love a good research question, so spent some time poking around and discovered that the Rapunzel-reminiscent stamp depicts a tale called The Golden Hair. 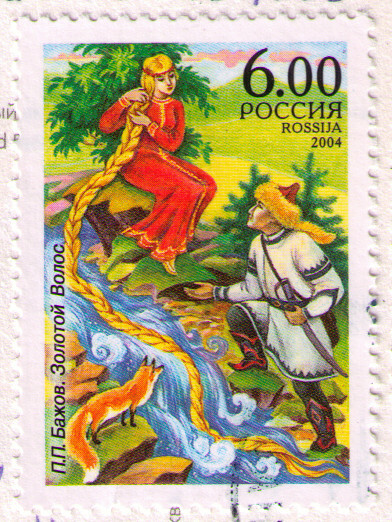 It was one of a set of three stamps commemorating the 125th birth anniversary of the author Pavel Bazhov who included The Golden Hair in his 1939 collection of Urals folktales. If this translation is accurate, it seems to be a rather different story than Rapunzel. On a somewhat related note, did you know that there is a classification system for folktales? Rapunzel, which was published in the Grimm Brothers' compilation of tales, falls into the "Maiden in the Tower" motif. The study of folklore and the similarities of tales from different counties and traditions is fascinating!" Thanks so much, Annie! I didn't know that there is a classification system for fairy tales, but somehow, it doesn't surprise me. The stamp is just amazing!Thanks a lot for the information. Well, I too never knew about the difference between these stories. This postcard is fantastic! I would frame this one if it landed in my mailbox. And, you're right, the stamps are amazing too. An all-around awesome piece of snail mail. Today I went to the Edward Gorey House!